In 480 B.C, when the Persians began their march onto the Greek peninsula, the allies argued about how to defend their homeland. Many thought resistance was futile, but ultimately, the patriots won out and the discussion turned to a strategy for stopping the Persians. 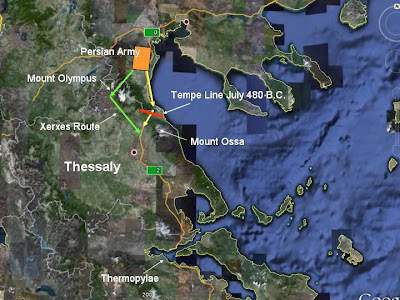 The loyalist Greeks decided to defend the Tempe Line, a vale between Mount Olympus and Mount Ossa in Thessaly. Unsure of the loyalty of the Thessalians, the allies did not include them in the plan. A force was sent north by sea under the command of the Spartan Euaenetus and the Athenian Thermistocles to take a position at the Line. Later, a warning was delivered from a loyal Macedonian, named Alexander, who had observed the Perisan Army on the move. He explained that the Greek position was vulnerable because of an alternative route around the pass which could be used to flank them. Realizing they had no other option, the allies returned to Corinth to modify their plan. Xerxes ending up using the alternative route the Greeks were warned about, and once he arrived, the Thessalians proved their disloyalty by taking the side of the Persian invader. When the loyalists met again, they decided Thermopylae would be the best place to form a line of defense.